Hello, Hello.. I welcome you all to androidcheapest.com. Today I'm going to tell you all about some of the features of Android which you probably do not know about. Everyone has it and its usage is increasing day by day or I should say that all this has become necessary and no work is done without it. During the use of Android phones we mostly use Calls, messaging, internet and games, we think that we have used it completely, but do you know that this is just you using only a part of an Android but actually Android is capable of doing many other things you cannot imagine. Calling and messaging is a very small thing that you use, but what you cannot do with its use it can become your personal assistant and protect your home and not only do many of your work for which you spend thousands of rupees. In this I have tried to give you the information related to it so that you can make the right use of your Android. 8 The best information about the work you do not know. There is such a useful thing in Android's interface that you can use one of them; you may not even know that the phone can be used like CCTV. This lets you see the live recording video of a phone in another phone. It is only available through a special application and the application is available on Google Play Store for download click here. For this, you need to download and install this application in both phones so that it can be used to name its IP webcam and it is better and easier for great use. Do you know that you can use your phone as a security camera? You might have been thinking that your phone can do this work also, and the security cameras and CCTV cameras are the same, but it is not so. If you spend your nose on the security of your house to protect her while one of your Android phones will do the work for you, however, the way professional security camera setup will work, it will not work. With security cameras, you can take care of your home from your phone, it will guard your home and as soon as someone enters the house, it will immediately inform you of noise. For this, you can use the application called Silent Eye from the play store and download it. Regardless of this, you do not know that you can set your phone to auto unlock. The special feature of this setting is that as soon as you go to a particular place, the phone will unlock automatically for the phone Go to settings and go to smart lock option, after which you will have to choose your trusted place after going through the option of smart lock, after which the phone will automatically unlock as soon as you go to the place of your set. This is based on the function of Google, it uses GPS, because of which you know the location you set. 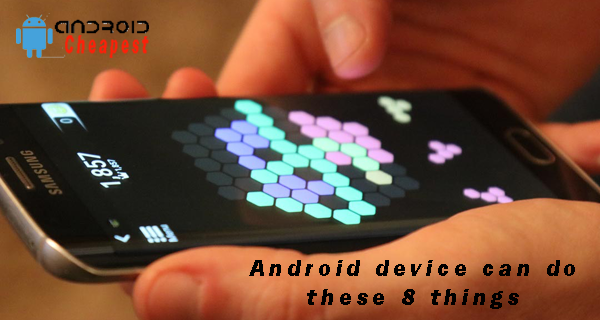 So far, you might have been wondering how this is possible but the Android OS can do everything for you. Let's say your car is standing somewhere and you do not know its location that your car is stacked so you will be able to know this way and easily find it. The special thing is that for this you need to download a third party app it does not matter. You can easily find it on Google Map, just by parking the car, opening the map and setting up your location on park my cap and then when you come back to pick up your car, your phone will tell you That's your park called park. If your phone is lost or lost somewhere, then you are more concerned about your data that no one misses it. In such a way, you can track your phone yourself or you can lock or erase its data so that you can get rid of android or You need to go to the official site from the PC Android device manager You can also visit this site or you can download its Android DeviceManager App too. If you do not want an app or a website to track your correct location, you can resort to the mock location present in your phone. This will hide your actual location and show everyone the fake location. This will get you into the developer option of the phone. You must first enable the developer option. To enable this, you have to go to your phone's settings and go to the phone option, you will have to click on the option of Build 7-8 times after which your Developer option will be enabled. You can also use a recycle bin in your phone like a computer. It will work completely like a computer, if any file or any photo, video is deleted from you, you will get it in the radioconf which will only give you the phone you will have to download the Dementier app in the Google play store. After installing it, if you want to delete a file or a video, delete the photo again through the TommyTestre apps. Ega. This will help you solve your Math, however, the brain starts to rotate in the solution, so this app will help you with all this, it may be good for those people who want to avoid meth's problem solving. In this way, you might be thinking about how a mobile will help you in it, let's tell you that this app will help you through your phone's camera. The camera will be open so that you will be able to solve the problems of your math, it will scan it, after which your answer will be coming. With just the answer to your question, you will be given full information along with the entire formula. You will have to download the photomath application for this. I hope all of you would love this article. Please tell me what you liked in the comment box and do not forget to share it and share it.